It's no secret that Halos of Hope is a charity very dear to me. I've been collecting chemo hats for a number of years for donating to a local cancer center, and this past January, with your help, we raised over $200 to help Halos of Hope ship hats all over the country. And, today, I'm here to tell you about a verrrrry exciting project I've been working on with Halos. 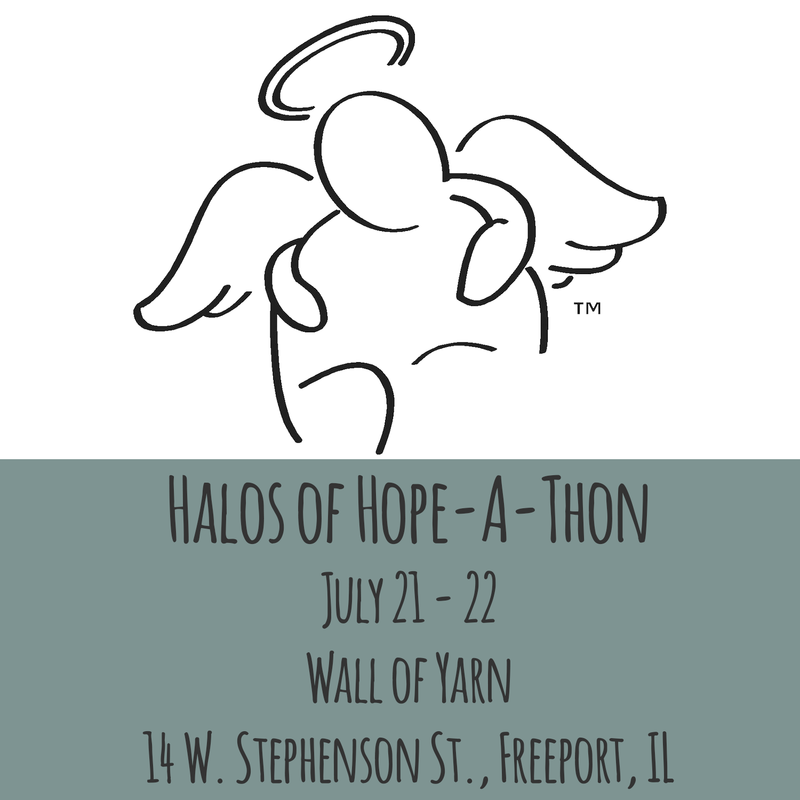 It's the Halos of Hope-A-Thon! That's right - it's a 24-hour hat-a-palooza! 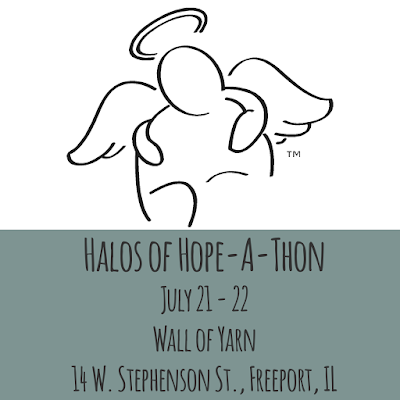 The Hope-A-Thon will be taking place on July 21 and 22 at Wall of Yarn in Freeport, IL. It's a lovely shop in a lovely town, and I'm so happy that they are hosting the hat-making fun. The Hope-A-Thon will start on Friday, July 21 at 8pm with a free lecture from Franklin Habit. I've attended several of Franklin's talks over the years and they are awesome. That alone is worth the trip! After the lecture, we'll head over to the yarn shop (it's about two blocks from where the lecture is being held), where the knitting and crochet fun begins. Stay for a few hours, stay all night, it's up to you! On Saturday, July 22, the Hope-A-Thon continues with more hat-making. Franklin will be teaching a class (with a portion of the class fee going directly to Halos of Hope. You'll need to sign up for that, and I'll share the details as soon as I have them.). As for me, I'll be there all weekend, helping the Halos of Hope crew! I'm excited to be a part of this event and hope you'll think about checking it out. Currently you can find details on the event's Facebook page. More info will be coming soon, including hotel and travel info. So stay tuned! Can't make it to the Hope-A-Thon? No problem, I've got you covered. This year, for my annual Hat-A-Thon, I'll be collecting hats to bring with me to donate at the Wall of Yarn event! I'll be having prizes and stuff for that in my Ravelry group. We'll be starting my hat-a-thon on May 1st, so be sure to join the Ravelry group so you don't miss any of the fun.